If you take a vacation to London do something really different. Live Shakespeare's London's history today. The New Globe Theatre is a major attraction for anyone taking a vacation to London. A tour of the New Shakespearean theater and a visit to the Bear Garden Museum during your vacation will provide you with a real 'feel' for Shakespeare's London. But your vacation and tour of the city can take you much further. The history of the Elizabethan theatres that were prominent during the life of Shakespeare is fascinating and we have provided a London Map detailing Theatres that Shakespeare would have most certainly known and visited and quite probably have acted in. Include the secret history of Shakespearean London during your vacation. We have researched the history and locations of many of these theatres and plotted their locations into a modern Map of London which is ideal for anyone taking a vacation. The names of many of these theatres still live on in the city as they are reflected in the names of many current London Roads. Although we are born in bred in London we were not aware of this. We were amazed to find a ' Curtain Road' on the exact site of the Curtain Theatre and a 'Fortune Road' on the site of the Fortune Theatre. These links with the past and Shakespeare's London are endless. The inn-yard and playhouses provide a special, but little known, interest for anyone taking a vacation in England. Take a visit to the Borough, in Southwark, and enjoy a drink in the George Inn Pub which was once an inn-yard theatre. William Shakespeare spent many years of his life living in the capital. But how many people know where he actually lived? One of his houses was in Blackfriars overlooking Ireland Yard. You can visit Ireland Yard which joins Blackfriars Lane via, would you believe, Playhouse Yard! Shakespeare left this property to his daughter, Susanna, and this is mentioned in Shakespeare's will. The history of Shakespeare will come to life - plan your tour and vacation around the sites of Shakespeare's London. Use the map, visit the locations and you will experience a unique vacation - Shakespearean history that is still alive today. The Map shown below is the key to visiting places in the city which even some Londoners will not be aware of. A wonderful place of interest is Gray's Inn. Click on the links to discover its history and tour the building where William Shakespeare actually performed. This map will provide you with a key to a 'Secret London' which is steeped in history. If you combine the places outlined on this Map with a visit to the New Globe Theater then you will succeed in acquiring a comprehensive understanding of the city of William Shakespeare. 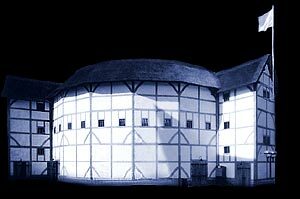 The pages of this website are crammed with information about William Shakespeare, Stratford, his life, his work, the Elizabethan theatres, the Playhouses and the Inn-yards. We love Shakespeare and hope that our visitors, especially those planning a vacation in our capital, are able to share in our passion for the man and our love of the wonderful City of London. The map shows the location of the major theatres, inn-yards and playhouses of the Elizabethan and Jacobean periods. Click on the red icon of your selected theatre. All known details of each theater indicated on the map, together with some additional theatres listed below, are described. Each page has a picture relating to the subject of theatres, inn-yards and playhouses to provide additional insights into each theater.